Bamboo is one of the fastest-growing plants on the planet. Technically a grass, bamboo is quickly becoming one of the key players in the eco-friendly movement due to its versatility and renewable properties. In fact, these plants have been reported to grow 250 centimeters in a single day! Since bamboo is a natural fiber, it is very environmentally friendly, and its versatility allows it to be used in a number of products. It is so adaptable that they are still discovering the many different uses for bamboo today. Bamboo is sustainable, biodegradable, compostable and recyclable. This unusual grass is also believed to absorb almost four times more CO2 than trees, putting out oxygen at the same high rate, further elevating its eco-friendly position. As a fabric, bamboo is absorbent, durable, soft, lightweight, breathable, moisture absorbent, thermal regulating, hypo-allergenic and antimicrobial. These qualities make it a perfect fabric choice for clothing (especially active and performance apparel), bedding, table cloths, curtains, gauze, bandages, surgical scrubs, reusable grocery bags and much more. People are surprised to find that bamboo is so durable and yet considered as soft as cashmere. This quality is due to the naturally round shape of the fibers, with no sharp edges or splintering that can cause skin irritation. The long length of individual fibers leads to less piling and more durability, making it easily able to withstand extensive wear and tear. 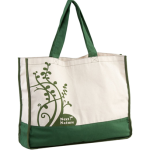 These qualities make bamboo fabric a perfect choice for reusable tote and grocery bags. The light, soft and durable bags stand up easily through multiple uses. They are extremely easy to clean, just toss them in the washer. A bamboo reusable grocery bag is also less likely to develop contaminating bacteria. Bamboo’s thermal regulating properties create a naturally insulating fabric, which makes bags made from bamboo even more suitable for carrying groceries, picnic lunches and many other items. 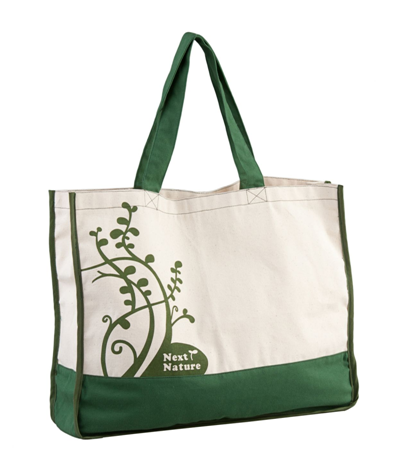 Give your customers a beautiful bamboo reusable grocery bags and demonstrate your dedication to a green lifestyle. Get started at customgrocerybags.com today.